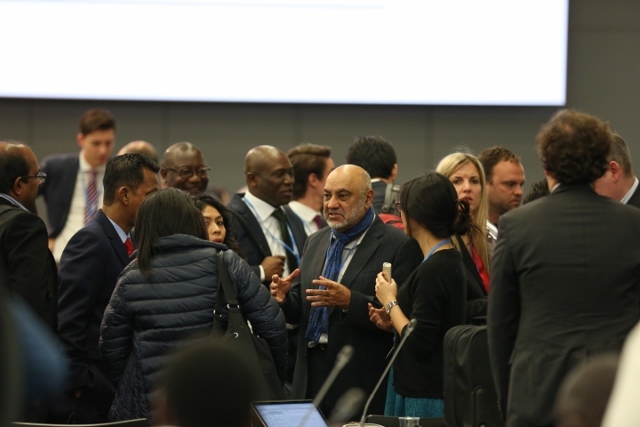 Negotiations towards a global climate change agreement resumed in Bonn, Germany, on Monday with a gathering of all 196 parties to the United Nations Framework Convention on Climate Change (UNFCCC) and observer organisations. Developing countries were unanimous in their criticism of the text produced by the co-chairs. While many developed countries—the EU, the US, New Zealand, Switzerland among others—also expressed views that the co-chairs' text was not something that could be worked on, the main disagreement between developed and developing countries was over the next step in negotiations. Countries were divided over whether there should be line-by-line negotiations on the draft text and redrafting of the paragraphs or a "hearing" all objections to the text orally and consideration of the next course of action. While developed countries wanted to use the draft or "non-paper" issued by the two co-chairs, Daniel Reifsnyder (United States) and Ahmad Djoghlaf (Algeria), developing countries wanted substantial "insertions" in the text before negotiations could begin. In an effort to build trust and consensus over the way forward, co-chairs of the Ad Hoc Working Group on the Durban Platform for Enhanced Action (ADP) had held a meeting of all heads of delegations (HODs) Sunday, October 18. While the introduction of the proposed "insertions" was agreed upon during the HOD meeting, it was not clear how the insertions would be captured. Early Monday, October 19, developing countries vociferously protested the suggestion to only "hear" the insertions without recording them anywhere. The discordant opening plenary stretched for an additional couple of hours with the co-chairs resisting the recording of insertions. South Africa and Sudan, speaking on behalf of G77 and China, were repeatedly snubbed by the co-chairs and their questions on modalities to be followed in capturing of insertions were either not answered or were given vague responses. This prompted a passionate response from South Africa who compared the proceedings to the Apartheid. In a sharp retort to constant refusal by the co-chairs to yield to the collective demand of 134 developing countries (G77 and China), South Africa told the co-chairs, "It seems you are arguing and negotiating with us as opposed to facilitating the session." With the co-chairs failing in their role, someone had to step up and break the deadlock. Mexico and Malaysia were key players in ensuring the deadlock was broken. They made two critical interventions. First, they proposed a middle ground between only a "hearing" of insertions and line-by-line negotiations. Mexico proposed that all parties must submit proposals and the secretariat must capture them, but that the proposals need not be necessarily debated and "accepted" by all parties. Secondly, in response to the debate over dictation of insertions on-screen by parties or only emailing the submissions to the secretariat, Malaysia and Mexico suggested that the "insertions" be displayed on-screen and key points orally highlighted by parties. These interventions were critical in breaking the deadlock and were welcomed by all parties, developed and developing. Considering the acrimonious nature of negotiations on day 1 and a list of many more sticky issues still to be dealt with, these two countries will continue to play a key role in taking the talks forward in a constructive manner.